There are many histories of photography in wartime: early images show cavalry standing at the ready, troops marching, piles of munitions, heaps of food; later on (as late as WWI) come actual scenes during the course of battle. War photography changes forever beginning in the Spanish Civil War, and then of course WWII. Korea, Vietnam, and then into the more recent past elevates the camera to being a third-person and fifth column. Looking through the WWI years in the Illustrated London News I experienced a creeping realization of a different sort of perspective in war photography: turning the camera to look behind the battle. Turning the camera exactly around, away from the action, hasn’t a good history in itself. There are some great examples: when the Golden Spike was driven at Promontory Point in 1869 someone had the foresight to look the other way and make a photo—it shows a vast plain, a long double ribbon of rail, a long series of telephone poles receding into the horizon, and one man. It is also a scene that looks pretty much the same today, if you took away the small dedication center that is there. That was the reality of the day, not all of those RR workers gathered around the two hot locomotives, the cleanest of them toasting each other and the camera. (If you look closely you can find some Chinese laborers in among the crowd and also occasional bits of Confederate uniforms.) Elsewhere in this blog I told the story of Ed Clark, the LIFE magazine photographer who wheeled his camera away from where the hundreds of other cameras were recording the removal of Franklin Roosevelt’s casket from Hot Springs and made perhaps the greatest photograph of the FDR years. But it is a different sort of turn-around that struck me for WWI. These are the photographs of the liminal spaces after the fight, the clean up, the gathering of spent ammo, the cleaning of the clothing, the care of the soldiers, the rehabilitation. And I’m not talking about the Matthew Brady after-battle battlefield photograph style. What I’m referring to is all of the “little” things that happen when the battles aren’t being fought and the troops weren’t on the move. There some images for thing that appeared in Harper’s Weekly and Frank Leslie and so on during the U.S. Civil War, but so far as I can tell the vast majority of them are drawings. Having looked through popular illustrated magazines that covered the Franco-Prussian War, the Spanish American War and all of the conflicts in-between, I just don’t have much of a sense at all that this life was recorded very well photographically. I can understand this—there’s not that m uch glory in sandbagging Red Cross stations, or hauling away dead horses by the thousands, or cooking thousands of loaves of bread in primitive conditions; they certainly aren’t a good case for a hearts-and-minds campaign. The camera has enough power to go ‘round, giving and taking, usually at the same time. But to my brain these photographs really come into being in the second half of WWI., and they tell an other, integral, more human story of that same war. The first image (above) shows two soldiers cleaning up cartridge cases after a fight—when you look closely at the photo you see that the place is littered with those cases. I suspect that there were hundreds of millions of these cases ejected from rifles. Billions, probably. I wonder how long it would take a thousand soldiers to shovel a billion shells into canvas bags? The picture reveals a very deep image of the ways of war at the most basic level. The next photo is a “simple” image of clothing out for a dry—except of course that the clothing lines go on and on, railroad tracks into the sun, tended by hundreds of women, getting the shirts ready for the “men in the trenches”, many of whom won’t need those shirts by the end of the month. Many of these men and women wound up being consumed--this photo at right shows one of the ways how that happened. It is an extraordinary crater some 75 yards in circumference created by a massive shell. It is a massive image--brutal, lonely, and speaking the quiet of the end. And it was a different sort of image that people were used to seeing in war reporting. These three photos appeared on only three successive pages of the 15 October 1917 issue of the Illustrated London News. In the history of science there are a number of instances where discoveries get passed by, or un-noticed, or un- (or under-) appreciated. Gregor Mendel’s 1865/6 paper embodying the discovery of genetics didn’t get noticed (for real) until 1899. The Alpher-Gamow-Herman paper (1948) postulating the background radiation for the Big Bang went unnoticed even after Penzias and Wilson found it (by accident) right where it was supposed to be. And so on. There’s another whole category of names associated with discoveries that have faded into obscurity even though their idea has not: Walter Pitts (neural networks), Vannevar Bush (the internet), Michael Servetus (pulmonary circulation, Rosalind Franklin (DNA), Robert Hooke (too much to mention), and so trippingly on. I had this second category in mind while grazing through the year 1940 in the Physical Review. I came across a very significant paper—a paper of exceptionally high standing, of direct interest to hundreds of working nuclear physicists—that, after publication, became invisible—or actually publicly invisible. The problem was that it was also of very high interest to the war effort, and it was published by a Russian. By a Soviet. The paper was by G.N. Flerov and K.A. Petrzhak (Spontaneous fission of uranium volume 58, page 89, 1940), and it addressed isotopes U-238, U-235 and U-234 and the influence of neutrons of different energies; their experiments revealed a new type of nuclear transmutation and observed the world’s first occurrence of spontaneous fission. And this of course was a big deal because of the military applications of the continuing series of discoveries on nuclear fission, and so the paper—as monumental as it was—passed without comment and without notice. Not because the paper didn’t merit it, of course, but because the powers that be thought it most prudent not to tip the very secret developmental hand of creating an atomic bomb. Years later in his book The Advisers, Oppenheimer, Teller and the Superbomb, Herbert York recorded the thoughts of Igor Golovin, who supported the work of Kurchatov who sponsored the research of Flerov and Petrazhak: “the complete lack of any American response to the subject of this discovery was one of the foundations which convinced the Soviets that the Americans were developing the bomb”. As was everyone else, probably. Peter Kapitza, one of the greatest Russian physicists of the century noted (on 12 July 1941) that—based on this work— it was entirely possible that a bomb could be developed that could kill millions of people. And it was right after this that these papers were no longer published in the Physical Review—for national security reasons. The Nazi-Soviet Nonaggression Pact was a pretty good reason for not wanting to "share" with the Soviets. The Soviets wouldn’t see the light until the Nazis ripped off the curtains with the start of their June 1941 offensive in Operation Barbarossa, beginning a brutal attack on Mother Russia that wouldn’t end until the Germans where defeated by Winter. Keeping the Soviets out of the loop was a good policy decision. In a way though it may not have mattered. The only country on earth that had the facilities and resources to develop the bomb was the United States--the sheer amount of energy alone would've consumed something like the majority of all energy resources needed to fight the conventional war for both the Japanese and the Germans. This list goes well on, but that's another story. Several years ago I purchased a very large collection of pamphlets of the Library of Congress. It was all housed in 2400 blue document boxes, all the document boxes were labeled and neatly ordered. The problem was that the classification scheme really didn’t relate to one thing in particular, and the judgment which set one pamphlet in a box wasn’t the same through and through—the alphabetization could have related to author or title or region or keyword or publisher. In short, each box was an adventure—and a lovely, bizarre one at that. It may be a unique one, too. The one thing that really did hold this thing together as a collection was that the vast majority of the pamphlets were not located in any other libraries in any part of the world. Now for many of them it was probably okay for the work to slip into a bliblio-singularity, but for thousands and thousands of others, it was a good save. And here’s the larger rub: as I classified and segregated the pamphlets into the “normal” areas of interest, I also started a pile of good-god-what-is-it pamphlets. The GGWII material was extraordinary—some had fantastic covers (and which many times was the most interesting thing about the publication), some had extreme titles, some had ludicrous subject matter, and some were just, well, bizarre. As the GGWII pile grew into the low thousands, I started to box them for a rainy day project, because I frankly didn’t want to deal with them. Some of the pamphlets’ covers/subject/title were rather mundane, pedestrian things when they were originally published; however, the high-winded sands of time ripped the flesh from this commonness, making them somewhat unapproachable, unknowable, and incredible--this group was called The Naïve Surreal . A subset of this group are works that were not approachable and enveloped by their own unique needs from the day they were born; pamphlets made of the stuff of incomplete dreams and adventurous vocabulary—the Outsider Logic group. The Naïve Surreal has all manner of representatives: pamphlets with just question marks or exclamation points as the title, or histories of unknown things, or beginning with “The Story of ______ “ [mud/zippers/a stone/a bubble/etc]. You get the picture. The Outsider Logic pamphlets are really very difficult to categorize—perhaps that is their unintended job. Today’s emergent beauty from the Outsider Logic collection is .A. Alles Suggest theory The Clock of the Earth, printed in Pug, Pa., in 1935. This pamphlet is only 18 pages long but I just couldn’t read it. "The Clock of the Earth represents strange matter from inner-stellar space collected and compounded at the equator which accurately controls the revolutions of the seasons…"
It goes on but I just can’t type it out. Sometimes there is a benefit to reading the Outsider Logic pamphlets, and sometimes the benefit is knowing the cover. Mr. Alles’ cover is striking and deeply inscrutable, as you can see. Somehow there is a system for the hour hand there at the equator, but it is mainly a secret, even though it is explained. Why the geographic locations are printed in the white space surrounding the earth and connected to Addis Ababa, the Nile, Gizeh and the Great Petrified Forest and placed the way they are and connected to the equator clock will have to stand as art rather than explanation. “Four thousand years ago the open spigot on the equator at longitude thirty-one degrees east of Greenwich , flowing directly to the pyramids in Gizeh…. “ Then there’s something about “exhaust flow”. Again, as I said, I just can’t penetrate this work. I’m happy enough with the art, forever open to interpretation. Without looking at the sub-title and explanation of this of this print (“Firing from Thames Mouth to the Edge of Greater London”) its purpose might be a fair mystery, given the ships and the targets and all. The two large ships at bottom are a Dreadnaught Class battleship and a (smaller) King Edward Class ship, and, yes, they are firing towards London—but they are doing so to illustrate a point on modern weaponry and the vast, new superiorities of British advances in the death/protection arts. and the River Medway proved a scorching defeat for the British, and propelled the rocky war to a quick peace favorable to the Dutch. This image shows what could’ve been the results of that engagement at Gravesend had the Dutch fleet been outfitted with the HMS’ new 12-inch guns—de Ruyter would’ve been able to reach the outskirts of London from that position, and could’ve b=done so from a distance of 25 miles or so. Of course the artist and editor aren’t really suggesting a “what if” scenario to the course of events of the Second Dutch War—they were merely creating a very compelling, highly illustrative comparison from old to new firepower, and to perhaps quite some fears about the strength of the Navy as the unstable and rickety international system limped its way into WWI, just five years in the future. Edward Baynard (1641-1719) of London must have been a pinchy/gouty physician. Or not. Perhaps he was an overdressed, deeply-dimpled fop. Or perhaps he was skinnily invisible, a plain, vanishing custard of a man, scrupulously clean and who saved all money, deeply in love with his chambermaid, sleeping on a mattress of gold. Returning to Dr. Baynard—he summarized the ten most important words and concepts in medicine in the second poem of his book, as follows. He held little in reserve. The engraving, Tabula Smaradina (“Emerald Tablet”) is Merian’s interpretation of the alchemical cosmology, a schemata and representation of the order of things. It appears (first) in Johann Daniel Mylius Tractatus III Seu Basilica Philosophica… (1618) and makes subsequent appearances in other works by the author, as well as in Lukas Jennis’ Musaeum Hermeticum (1625, see below). Basically, the Emerald Tablet shows the opening of a complex heaven and the delivering of the philosopher’s stone to the earth. It is a magnificent effort and no doubt has a great power to alchemists, and I can understand only a bit and a piece here and there. For example, in the bottom right, we see a couple of people holding a((n) eclipsed?) Moon, standing on the wings of an eagle which protects a double hemispheric representation of the constellations. The figure on the right is a naked woman, who may well represent Luna: her right breast is a star, and from her armpit is a streaming torrent of stars which comes close into contact with shrubs labeled with the astrological signs of the planets. The cluster of grapes in her right hand and the stream that she is straddling must indicate a generation, or a birth, or rebirth, or time, or the universe. Luna is connected via something to the heaven-element which in turn is connected on the left sign of the print to a man holding a sun, who I guess must be Sol. Heaven and Earth, Brother Sun and Sister Moon, and so on. From here it all gets away from me, no that it isn’t gone already. This lovely, seemingly antique daguerreian view is what the American Expeditionary Force (AEF) commander General JJ Pershing saw at the front lines of St. Quentin in July 1917. The U.S. had entered the war, finally, on April 2 1917, nearly three years after the war began, landing in France 13 June 1917 and entering almost immediately into battle at Chateau-Thierry. On 2 July Pershing estimated that the U.S. would need a million fighting men; the day that this photo was published in The Illustrated London News, he revised that estimate to three million. The view he was seeing here was more than of a town about to be pounded by thousands of artillery shells--the magazine was sharing a view of what the European and Empire countries had been seeing for 31 months, and what the Americans would now be sharing for another 17 months. 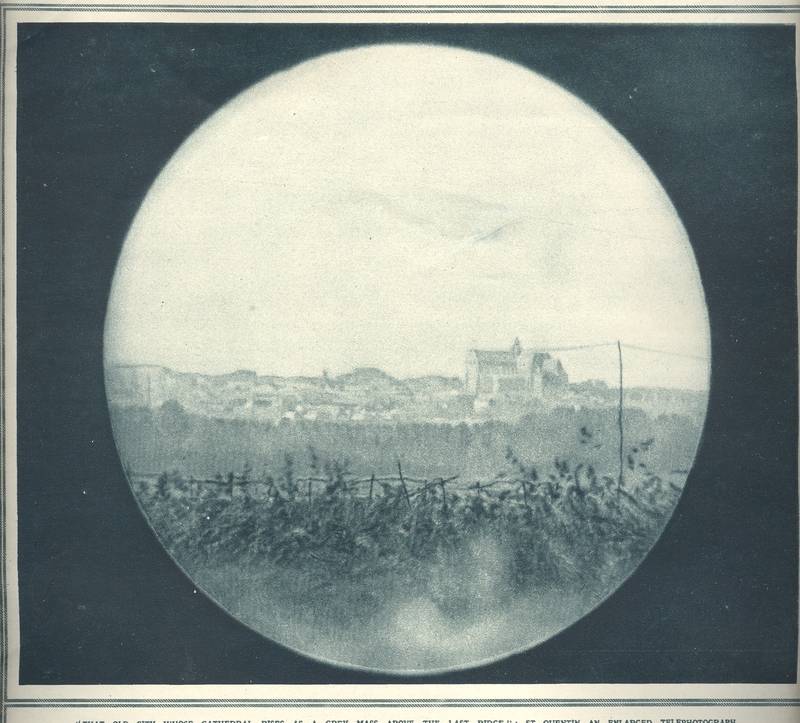 It is a beautiful and deadly view, seen through French field binoculars at the tip of the front for the battle. The large building to the right is the town's Gothic cathedral/collegiate masterpiece: it was old and large, with a 370-foot-long and 130-foot-high nave. It was a highpoint for that part of France, and was the burying place for St. Quentin and St. Victorious--their graves would be covered by the rubble of the cathedral's collapsed roof very soon after this picture was taken. The building was shelled and burned all night long--the French blaming the Germans and vice versa. If Pershing had really good sight he might've been able to see the 116,000 American soldiers w ho would be killed in battle, though I suspect he had a pretty good idea of what was to come, thinking as he did that he need 3 million soldiers. To be utterly fair I don't think that he could've possibly seen in his imagination what 9 million dead soldiers looked like, or what 16 million dead soldiers and civilians looked like, or what 37 million dead and wound soldiers and civilians looked like, all the casualties of this war, all done in 4 years. I've found it odd in a way that I've not really been able to explain that Pershing is buried so very close to Ira Hamilton Hayes at Arlington. I used to leave a good twig on Jackson's headstone on Memorial Day, and then get that unusual, uncomfortable emotion on seeing the large Pershing monument just a few hundred feet away. A Cosmology Seeded in Salt? I've written a little earlier in this blog about the beautiful Claude-Nicolas-Ledoux (1736 —1806) being the 18th century Marcel Duchamp (or vice versa). I was struck by this image by the master--a depiction of the Earth nestled in clouds amongst other planets in exceptionally close proximity. There was evidently very little explanation to go along with this idea, except that it was inspired by his utopian plan for the saltworks of the factory-village at Chaux. On the face of it there seems to be no physical connection between the two--it must be the philosophical connection that Ledoux was thinking about. From my point of view the idea for the city of Chaux was of course idealistic, perfect, communal, with a vast sense of fairness and correctness, and of great sensibility. It was a "gathering of brothers" as Ledoux wrote, a city of lodges of workers, gathered together for mutual profit. Perhaps this vision of cushioned planets was a larger expression by Ledoux of heavenly gratuity? Anthony Vidler points out (in his book The Writing of the Walls) that Ledoux described his utopian Chaux as a "galaxy of...utopian forms" (page 101). Since Ledoux also described the architect as the "delegate of the Creator", perhaps he reverse-engineered a cosmology describing a mutually beneficial community of planets from a community of brotherhood gathered around the (admittedly important in 1780) production of salt. Or perhaps not--this may just be way to simple and, well, just wrong. NOTE: I do just want to point out here (and discuss at another time) that Ledoux was by no means the first to describe multiple-world systems. One of the prettiest of the earlier attempts, for example, belongs to Bernard le Bovier de Fontenelle who published this delightful rendition of an extra solar-systemic galaxy in 1682 in his Entretriens sur la pluralite des mondes. This sort of thinking was somewhat well-established by the time Ledoux offered his idea around the time of the turn of the 18th century. For a beautiful romp, have a look at Ledoux's L'Architecture considérée sous le rapport de l'art, des mœurs et de la législatio. I've included a short list of projects (with links) in the expanded reading section below. The History of Dots, Part 10. Edwin Abbott’s slender Flatland is perhaps one of the best books ever written on perception and dimensions, a beautifully insightful book that was quick and sharp, and in spite of all that was also a best-seller. Written in 1884 when Abbott was 46 (Abbott would live another 46 years and enjoy the book’s popular reception), it introduces the reader to a two dimensional world with a social structure in which the more sides of your object equals power and esteem. Thus the lowest class would be a triangle (three sides) while the highest (priestly) class would be mega-polygons whose shape would approach a circle. Abbott’s magistry comes in explaining to the three-dimensional reader what it was like to be in a two-dimensional world. And to this world one day came an epochal event. It was a dot. The dot was a magnificent new thing to the 2-D world, and what happened was this—it grew concentrically and outwardly, expanding and then contracting in a series of circles, morphing until it appeared as an entirely new and revolutionary form rising from the plane of Flatland. It became a sphere. The sphere was from Spaceland and amazed the population of Flatland (Lineland, actually); the story was (and the book’s title page saying it was written by) a Square, whose deep interest was immediately enhanced by its great imagination. It turns out that once every millennium the good folks of Spaceland visit Flatland to return one its inhabitants home to try and introduce them, educate them, to the idea of added dimensions. Safely in Spaceland, the Square was presented with the radical newness of the third dimension, it engaged the Sphere about the possibilities of yet higher (fourth, fifth and sixth) dimensions. The Sphere was not altogether please—talk of higher dimensions in the3-D world was outlawed just as the discussion of the 3-D world was in Flatland. Pissed, the Sphere returns the Square home to its land of lines. The Square finds it very difficult to be home again. (Did I ever mention here that my house is about a thousand feet away from Thomas Wolfe’s grave?) It finds it a very tough go to convince anyone of its journey and the existence of another dimension. To complicate things further, Abbott has the Square dream a remarkable thing—a visit to Pointland, a totally self-involved dimension consisting of one ruler, a Point, which exists across all area and things. Even Square’s introduction of an idea or question comes to the Ruler of Pointland as an idea from its own head, because nothing and no one else exists. Fantastic! Eventually, things go badly for the Square—the edict is described making it illegal for any further discussion of the third dimension, with dire consequences on a sliding scale according to class./caste/sides, with death the penalty for the Triangle. The Square itself winds up in prison, an unhappy being locked “in” a cell and prohibited in its mind. But Abbott is certainly successful in relating the possibilities of higher-dimension thought by introducing the view from a higher- to a lower-dimension. Still, it’s a tough go. hero of early modernism—also drew on the work of Jouffret, and made no secrets about the path of his intellectual foundation (unlike the squirrely Picasso). And so from the lowly dot comes a beauty unsuspected in soliphismy Pointland. The Little Flower was publicly coming to grips with "enemy aliens" in this small pamphlet, published in the last days of December 1941. Laguardia--a Republican Congressman defeated for re-election in the Roosevelt landslide of 1932 and elected Mayor of NYC in 1933--was an outspoken critic of the Nazis and Hitler from his first day in Gracie Mansion. In addition to being the first Italian-American elected to the U.S. Congress, Laguardia was also Jewish, and was a superb and constant speaker* against the monster in Germany. In this pamphlet Laguardia outlined the legal implications of war and the non-citizen German or Italian immigrant, and possibilities and consequences of their being declared enemy aliens, resulting in "arrest" and detainment. (This applied to all "...natives, citizens, denizens or subjects..." of any foreign nation or government with which the United States is at war, and who could be "... liable to be apprehended, restrained, secured and removed as alien enemies....".) Attorney General Francis M. Biddle cited Department of Justice figures: "Of the 1,100,000 (sic) enemy aliens in the United States, 92,000 were Japanese, 315,000 were German, and 695,000 were Italian. In all, 2,972 had been arrested and held, mostly Japanese and Germans. Only 231 Italians had been arrested**" (by 1943). By the end of the war, there were fewer than 3,000 Germans and Italians who had been impounded (the Italians being released by October 1943 following Italy's surrender). There were upwards of 100,000 Japanese-Americans impounded, half of whom were American citizens. For some reason there was not a single mention of the Japanese population in this pamphlet. *In 1933, the year of Hitler's major seating, Laguardia said: "Part of [Hitler’s] program is the complete annihilation of the Jews in Germany", an uncommon and of course prescient point of view. **This authority was based on Executive Order 9066 (issued February 19, 1942) and Executive Order 9102 (issued March 18, 1942). These orders authorized the "removal from designated areas of persons whose removal is necessary in the interests of national security". The biographical bits I've found on Libby support him as a a decent pacifist. His National Council for Prevention of War--which hosted his speech at the Garden--was evidently his great achievement, though his subject matter was not. Now it isn't as though there was a spearhead movement to get the suffering U.S. involved in European activities in 1938--and remember it took 27 months after the invasion of Poland to get the U.S. into WWII, and that took a massive attack by a non-European entity. So Libby's "No!" was really playing to the strengths of the majority. The U.S. was still in the grip of the Depression--and had just suffered another fresh setback in that year--so there wasn't much public concerted support for stopping the very visible spread of Fascism around the world. So as eyebrow-raising as his immodest title might seem, it did reflect the answer that most people in the U.S would have given to that question in the spring of 1938. Unfinished in some ways is part of something that is not there, part of the missing, the blank, the empty. One aspect of this calling to emptiness is seen in this semi-completed, semi-empty trial proof version of Albrecht Durer’s intaglio Adam and Eve (1504) , the finished and full state of which is seen below. The unfinished bit is easier to see but hard to find, sometimes. Leonardo comes to mind several times: the magnificent Sforza equestrian statue and St. Jerome Praying in the Wilderness come to mind, as with his Study for the Adoration of the Magi. Gilbert Stuart’s ultra-famous mostly-finished portrait of George Washington wound up in thousands of schoolrooms across the United States as well as—cropped—one the one dollar bill. Nearly-as-famous Benjamin West left unfinished another icon of revolutionary American history, the American Peace conference, half of the historical figures faded unfinished into history. There are some things that are unfinished but really aren’t so: say, for example the not-endable Ulysses, complete and incomplete in its circularity. Mozart’s Requiem, a piece of music that helped drive the poor man to his death, was unfinished though completed by another hand. There are unfinished examples of architecture bounding into the urban landscape, fantastic examples of extraordinary things. The great Schloss Neuschwanstein, the empty and unfinished dream of the “mad” and mysteriously murdered King Ludwig of Bavaria, is certainly one. This building ironically seems for me more compelling, filled far more than Uncle Walt’s doppelganger in Orlando. The greatest structure of the Drippingly Baroque is another unfinished masterpiece, the work of Gaudi in Barcelona, the Sagarda Familia. Started in the 19th century and stopped with Gaudi’s death in 1926, the Sagarda’s forest of towers was only 15% complete—the city is still at work on it, with 40% more to go. We could look at these images while listening to audio examples of the unfinished: the tidied-up requiem of Mozart, Schubert’s unfinished 8th Symphony, and Mahler’s unfinished 10th come to mind. There are spectacular monuments to unfinished business: American Federal treaties with Native Americans (almost all of which were signed, documented and not enforced; empty, blank, broken); the assurances to the millions still waiting for some verifiable change in the townships of South Africa; promises of decent wages and health coverage for the marginalized “partners” of oblivious behemoth monsterstores. [I can think of one major player whose corporate name spelled backwards relates to railroading the law, driving that point home to employees, suppliers and patrons. “Tram Law.”] A history of unfinished business would be massive, and then, once you got to the end, all you’d be doing would be driving a Ford Pinto off the end of an unfinished bridge. Some things that looked sort-of finished are later revealed to be not so: Einstein’s Unfinished Symphony of relativity (titled so in Listening to the Sounds of Space-Time by Marcia Bartusiak) is one. Mathematics—all of mathematics—also comes to mind, the great edifice nearly “completed” by Hilbert until one of his famous questions got answered by Goedel, and then all became unfinished again. One day everything seemed filled-up; the next, well, it wasn’t. The Measured Intelligence of the Letter "C"
I’m sure that by now everyone has seen those “are you smarter than____ (Barack Obama, 130 I.Q. )” pop ups seen on some news sites. (I doubt that President Obama’s IQ would be that limited; his predecessor, well, let’s not comment on that.) Giving in, and dumping twenty-five minutes that I’ll never get back, I took the test. Three times. The first time I filled in all the answers as “A”; the second time, “B”, and the third, “C”. It turns out that the IQ for A was 80 and for B, also 80. C, however, came in at 90. C seems to be the smartest of all of the first three letters of the alphabet. And what of lonely "D"? I could not but forebear to press on with my life, leaving it an alpha-intelligent mystery. Did I mention that I’ll never get those twenty-five minutes back? Late last month I wrote a short post about an antiquarian fish-eye view of the city of Vienna(1529). (“I've paid some attention to antique images that look straight down at things (Looking Straight-on At Things and Looking Straight-Down on Things) and I can say that they are in general pretty uncommon--this is the first time though that I've noticed a fish-eye view looking straight down, an image conveying a 360-degree horizon-to-horizon landscape.”) I’ve not found another antique view like this, but I did just come across this magnificent work by M.C. Escher (1989-1972) called Tetrahedral* Planetoid, produced in 1954 and now living at D.C.’s National Gallery. The view of the planetoid is quite complete, as we can see individual houses and even some people What I find particularly amazing, apart from the design of course, is that this meticulous ideal was an engraving done on wood. It is a glorious accomplishment, and a joyful optical shock to the system. .
*A tetrahedron (plural: tetrahedra) is a polyhedron composed of four triangular faces, three of which meet at each vertex.